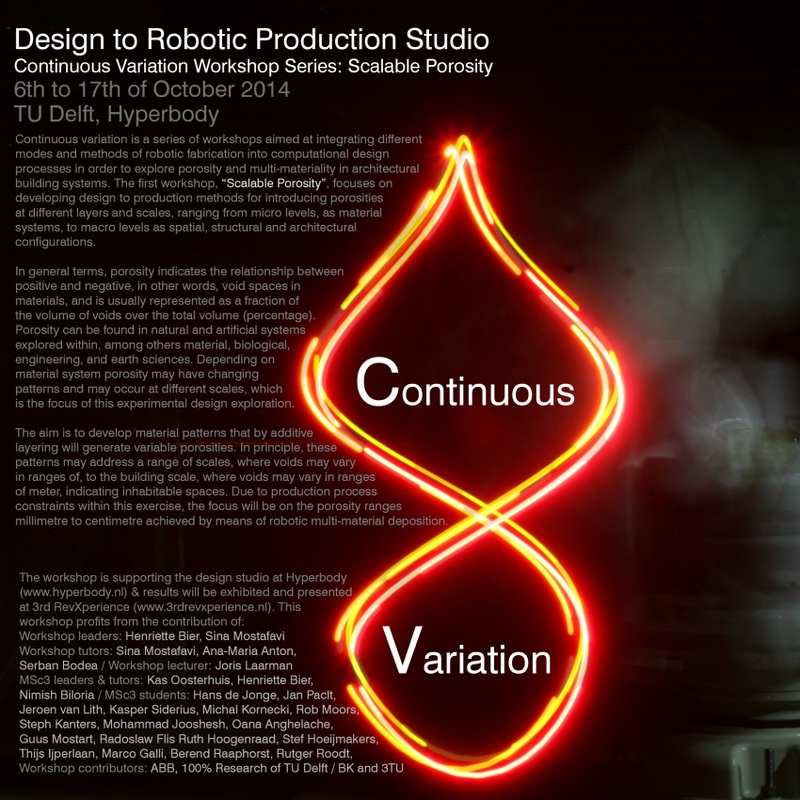 Continuous variation is a series of workshops aimed at integrating different modes and methods of robotic fabrication into computational design processes in order to explore porosity and multi-materiality in architectural building systems. The first workshop, “Scalable Porosity”, focuses on developing design to production methods for introducing porosities at different layers and scales, ranging from micro levels, as material systems, to macro levels as spatial, structural and architectural configurations. In general terms, porosity indicates the relationship between positive and negative, in other words, void spaces in materials, and is usually represented as a fraction of the volume of voids over the total volume (percentage). Porosity can be found in natural and artificial systems explored within, among others material, biological, engineering, and earth sciences. Depending on material system porosity may have changing patterns and may occur at different scales, which is the focus of this experimental design exploration. The aim is to develop material patterns that by additive layering will generate variable porosities. In principle, these patterns may address a range of scales, where voids may vary in ranges of, to the building scale, where voids may vary in ranges of meter, indicating inhabitable spaces. Due to production process constraints within this exercise, the focus will be on the porosity ranges millimetre to centimeter achieved by means of robotic multi-material deposition. In this studio we are aiming at developing and experiencing a design-to-robotic production process in order to design an outdoor urban furniture. As an architectural object the piece of urban furniture will provide the city and its citizens a unique place to seat, gather and shelter. For this exercise we are going to develop an adaptable and scalable building system that can be later applied at both larger and smaller scales. This means that the computational logic of the design process would consider design goals and considerations regarding material distribution both at macro and micro levels. At macro scale, the design will provide a meaningful scenario of porosity or openness and closeness at identifiable urban and human scales. At micro level this logic can be reflected on materiality, and the performative porosity pattern would control the material distribution and structural morphology. In this context, scalable porosity, which would be produced by means of a customized robotic design-to-fabrication process, would create integration of systems at different scales, from urban relations to structural and environmental integrity and from local ergonomic conditions to overall material deposition. The size of this architectural object is bound to a maximum volume of four cubic meters with no limit for the dimensions at the beginning of the design process. The total material usage in this volume would be heterogeneous and continuously varied from point to point, based on the rules, logics and constraints that the computational design systems will define and suggest. In order to realize the aforementioned goals, we will start with three points in the bounding volume, in a way that each of these three points focuses on one to two essential design parameters ,such as structure, ergonomics, skin condition, etc. For each of these parameters there will be two initial design to robotic production experimentation phases, one with marker 2D drawing, for pattern studies and one with multi-coloured light 3D mapping, to study the macro level material distribution in the bounding volume. These two initial studies later would provide inputs for numerically controlled robotic material deposition, in this case coloured clay. Therefore, in parallel to the initial experimentations, through preliminary material studies such as customization of recipes, testing with different viscosities, etc. each group will methodically develop a customized materially informed design-to-production system. Every group will produce, at the end of the first week, 1:2 scale prototypes and at the end of the second week 1:1prototypes. It is important to consider that purposeful alteration of the production system is also one of the goals of this workshop, therefore especially in the first week experiments, alongside the design development, students will customize the manufacturing process by combining multiple modes of fabrication and strategies. This process of customization can be realized through developing novel methods and innovative ideas for translating geometry to robotic motion. Material deposition must therefore be controlled through microcontroller boards and thus synchronized to the robotic motion path. The formats of the deliverables will be discussed and defined in detail. In addition to the mentioned deliverables files, codes and models will be uploaded to the wiki and shared via our drop box folder in readable and neat formats. This page was last modified on 10 October 2014, at 10:55.